In a class of its own. The professional Reebok Deck is a revolutionary, reconfigurable exercise platform which marks the latest evolution of the ever-popular original Reebok Step. 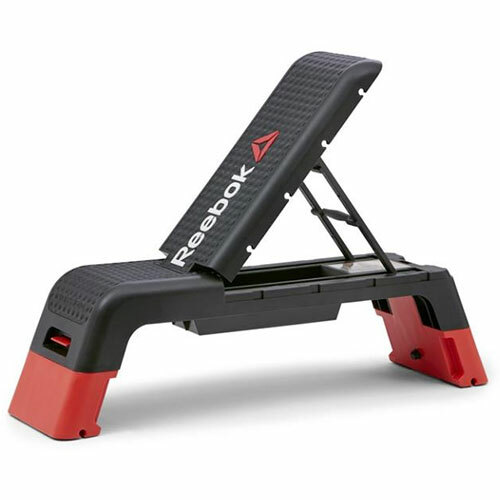 The Reebok Deck enables you to perform effective cardio workouts based on aerobic stepping, plus it can convert into a flat, incline or decline weight bench to add strength training to the routine. When used as a Step, the Deck’s height of 8” (20cm) is ideal for low impact aerobics but if you’re looking to increase the intensity, simply use the integral risers to elevate the deck to 13” (35.5cm). This is versatility at its very best. With its natural inertia, low centre of mass and non-slip rubber surface, the Reebok Deck remains dependably stable and safe throughout every workout. And, compact in size, can be easily transported and stored away. Add in Reebok Dumbbells and Reebok Resistance Tubes using the Deck’s integrated locators and you have a flexible cardio and strength option that’s ideal for personal trainers and studios. It takes a mere few seconds to adjust the leg and back positions of the Reebok Deck with a simple click and lock mechanism. This is beneficial when used in time allocated gym classes.